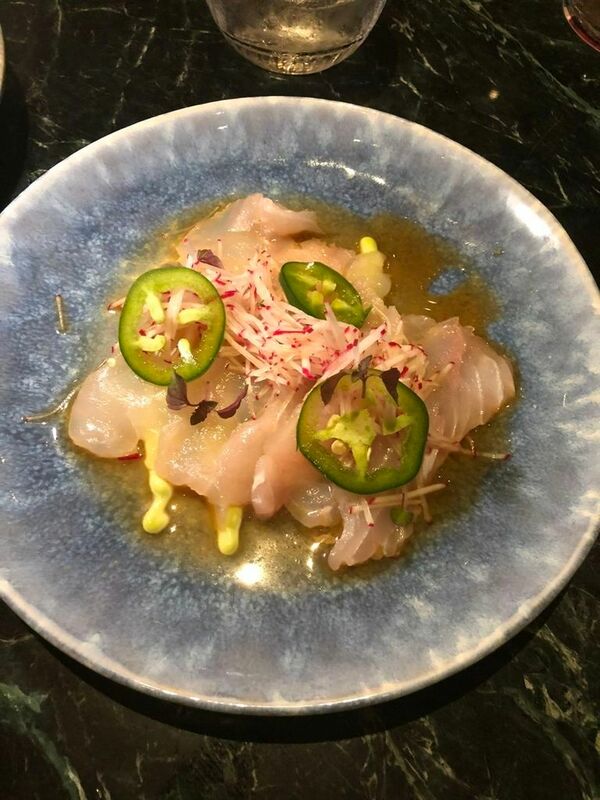 Slices of fluke crudo with avocado, jalapeño and radish are marinated in yuzu. Riding the escalators to Bluebird London on the 3rd floor makes me hungry to shop. First there was The Crown on Netflix. Then came my post-adolescent crush on Meghan and Harry. I haven’t been to London in decades. 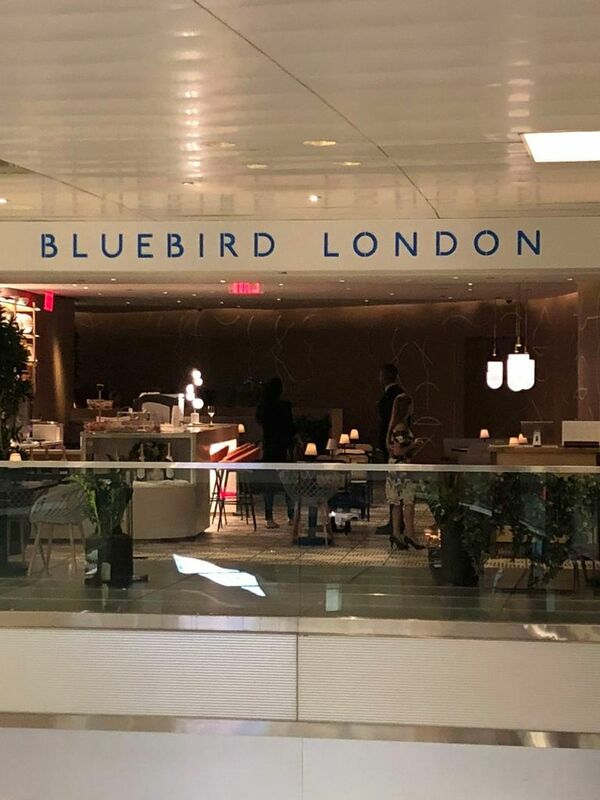 Now I find myself looking forward to an immersion in eating British at the new Bluebird London on the third floor of the Time Warner Center shopping mall. My last exposure to True Brit was in 1993. “It’s true eating here is better than ever,” I wrote then. 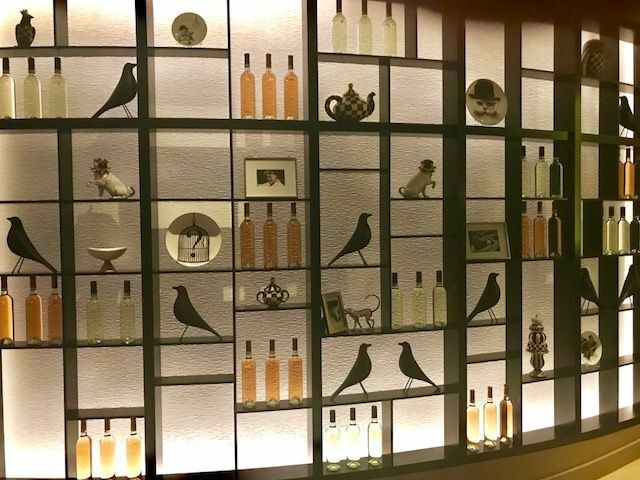 I like the look of Bluebird with its many different chairs, and an illuminated wall of bird and odd whimsys. 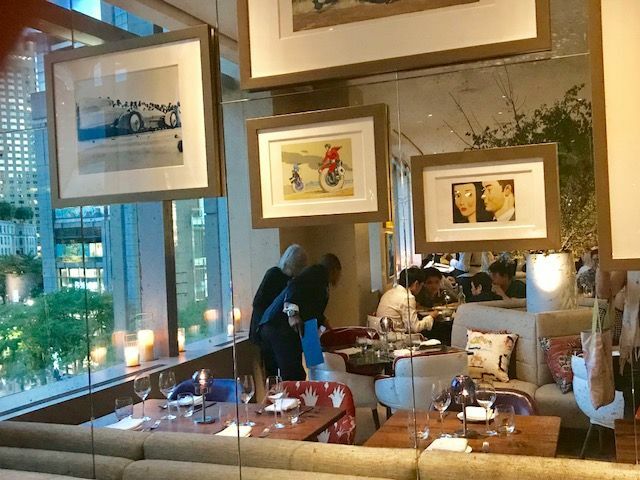 Here reflected in a mirror with odds and ends of framed illustrations, we settle into a four top. Other restaurants in town are trying to eliminate bread and save money but Bluebird sends out a full basket. 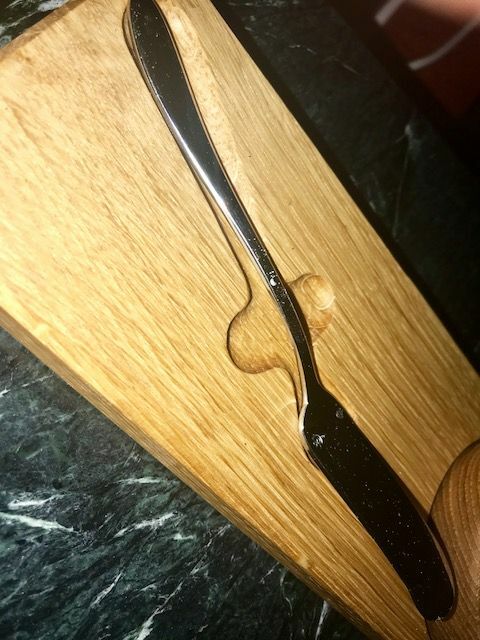 Maybe they just want to show off their unusual butter presentation with a knife that fits into it. That’s the Bluebird London I’m expecting. The new place is vast, allowing for a bar, a lounge, a secluded party room, breakfast, tea and all-day eating. For now, the four of us are settled next to the window with its view of Christopher Columbus and Central Park. Bluebird is still working on the kinks and the kitchen is slow. 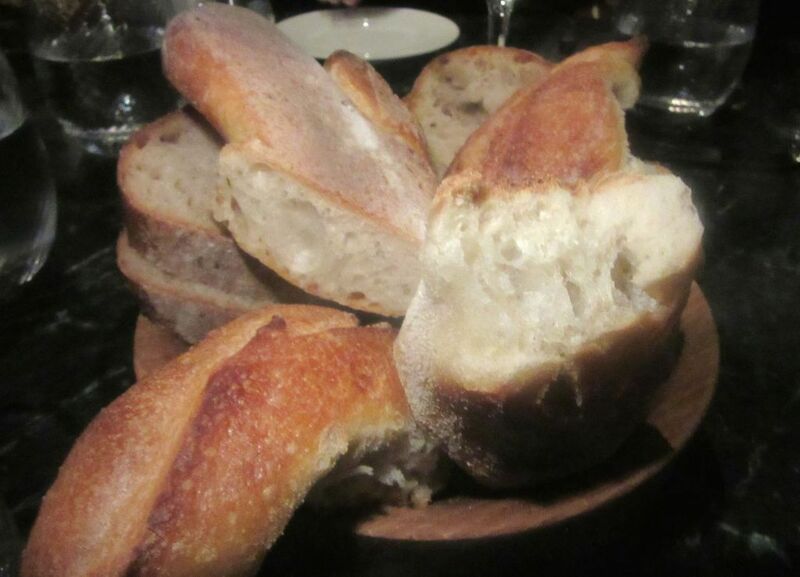 We’re eating too much bread, warmed but not warm enough, with butter delivered on a couturier wooden knife holder. 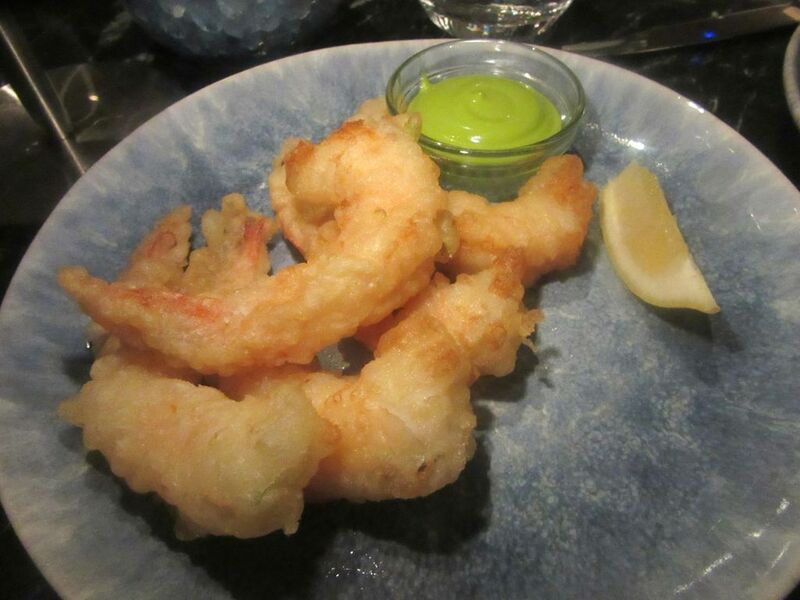 That first evening early in Bluebird London’s arrival, the shrimp tastes fried ahead and refried. 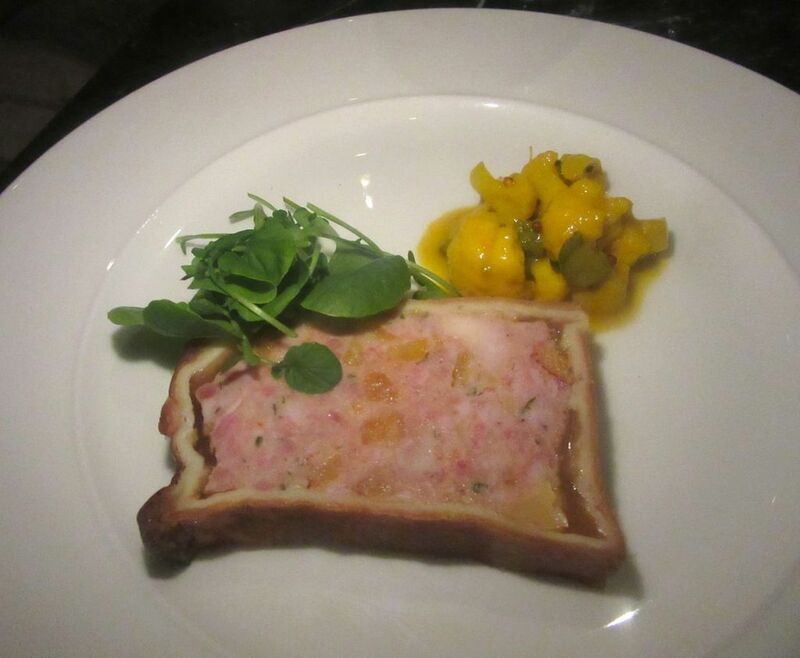 The classic terrine en croûte comes with a small pile of pickled cauliflower and cornichons. My pals are used to sharing dishes -- starters and main courcses -- often crowding the table. The shrimp tastes pre-fried and rewarmed. These are definitely not the great local tomatoes of September. I put a chunk of very good terrine on the excellent rye bread that comes with the crab. We are amused to see the menu calling it Long Island crab. I don’t think I’ve ever tasted Long Island crab. 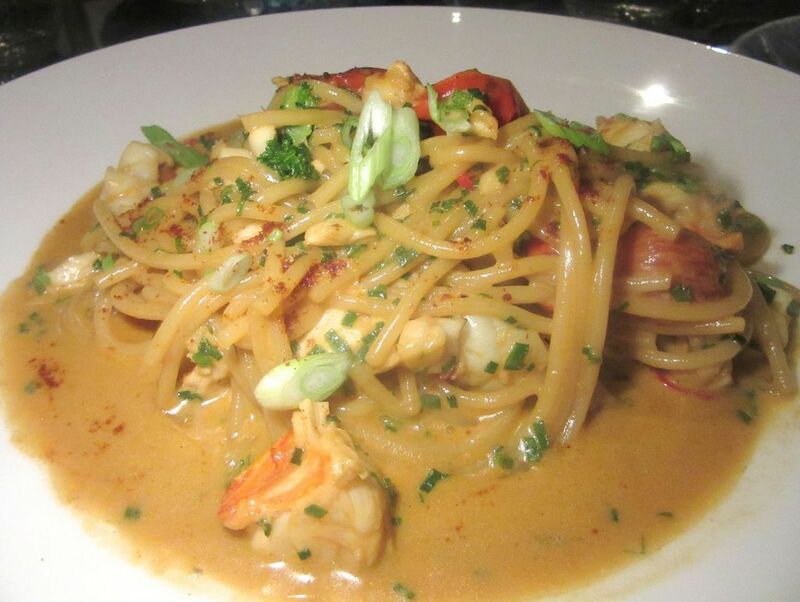 The kitchen delivers a large portion of spicy lobster spaghetti with tomato and scallion, a Bluebird classic. 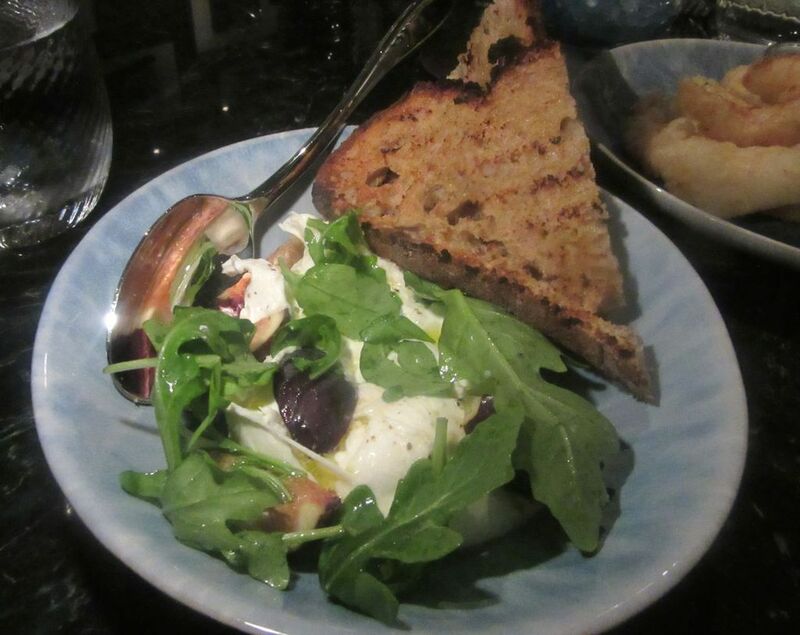 That first evening, the house sent a gift of “Long Island” burrata with arugula and grilled sourdough. We have Long Island mussels, Long Island clams, and Long Island bluefish. But I don’t think we have what the menu calls Long Island burrata. 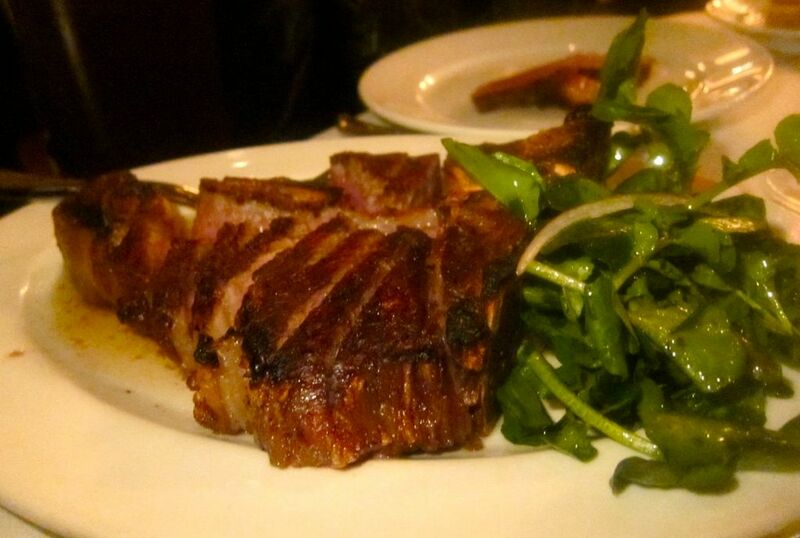 “Do you think Long Island cows are producing burrata?” Diane muses. 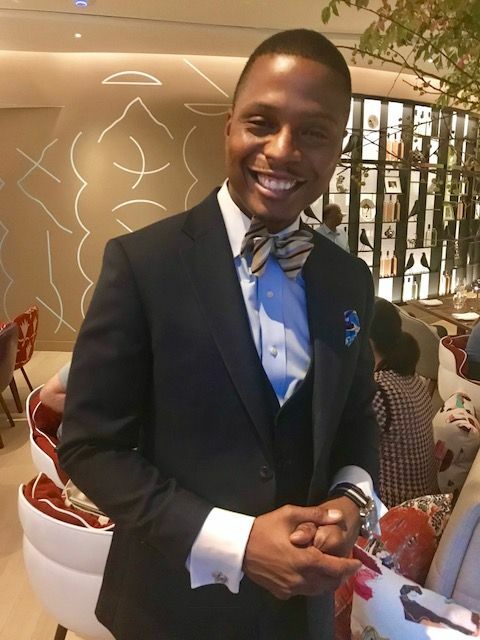 Dante Blakeley, the gentle dandy we discovered at L'Amico greets us at the entrance to Bluebird. Our waiter tonight is elusive. He seems to be catering to a third of the room. But when he pours the Pinot Gris, he tucks one arm behind his back. The serving team doesn’t know everything, but they’ve been drilled on that. There’s a classic service of monkfish and shrimp curry with rice, chutney and crisp parathas. 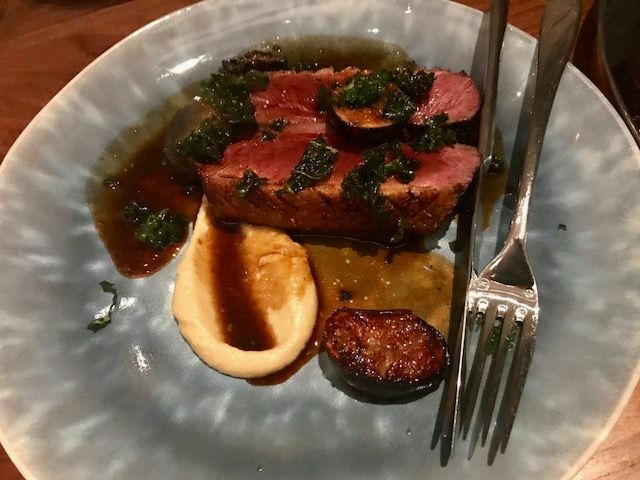 Thick slices of rare five-spice duck breast are served with parsnip purée, figs and honey. 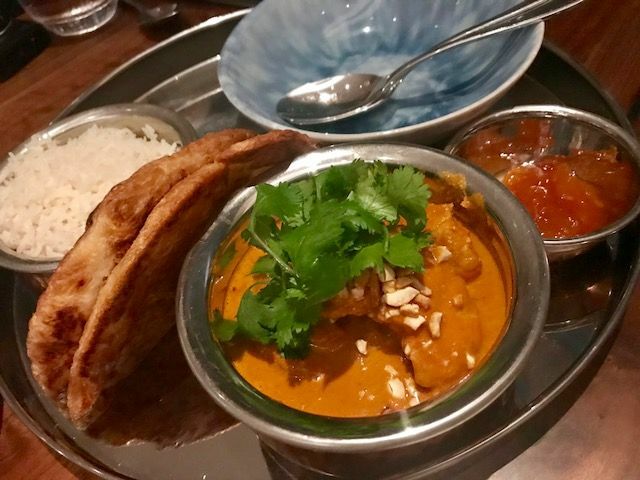 As I noted, not every dish pleases, but order one of the “Bluebird Classics,” lobster spaghetti or the monkfish and shrimp curry with paratha and mango chutney, and you’re good. 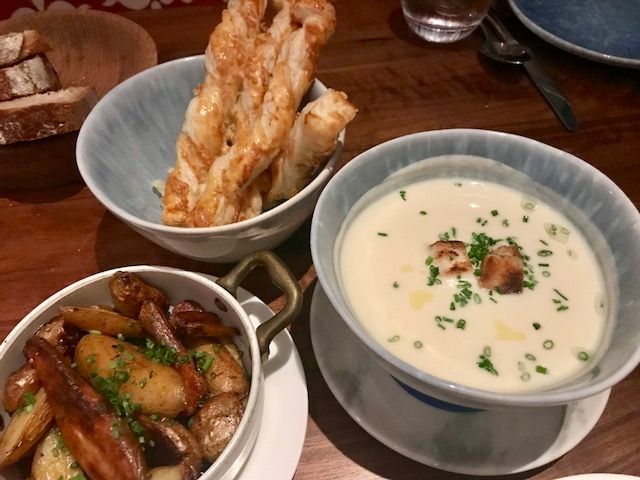 Choose your own entrée -- $24 to $55 -- the five spiced duck breast or roasted thick-cut Atlantic cod with little neck clams on creamed potatoes. Or share everything as we do. The celeriac soup arrives dangerously. It takes a while till we dare risk a small taste. 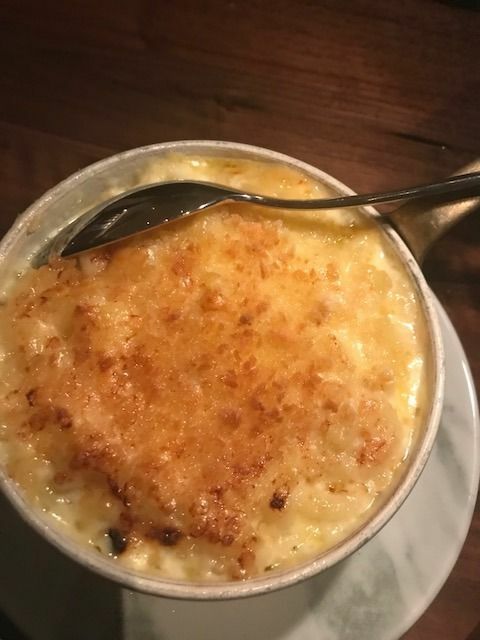 I’ll take the $7 macaroni with Montgomery cheese over the $24 goat’s curd and gruyere soufflé. Once it cools a bit, a friend and and I both savor the searingly hot celeriac soup. That and the $7 side of macaroni and cheese would make dinner for me. 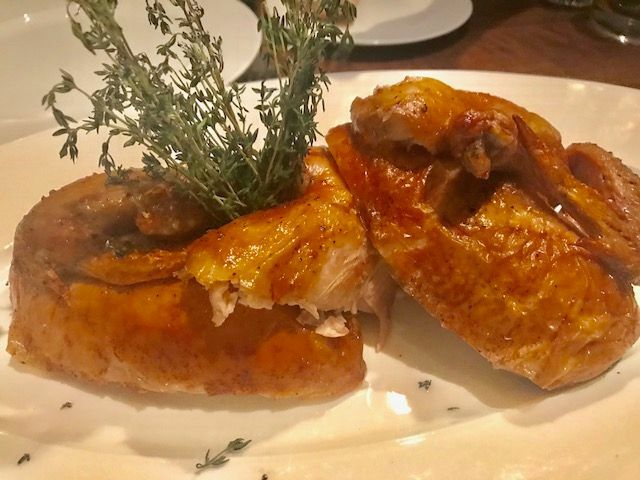 The whole spiced farm chicken for two had enough legs, thighs and white meat to please every preference and more to take home for lunch the next day. Nobody touches the roast juices or the bread sauce. Bread sauce must be English too. 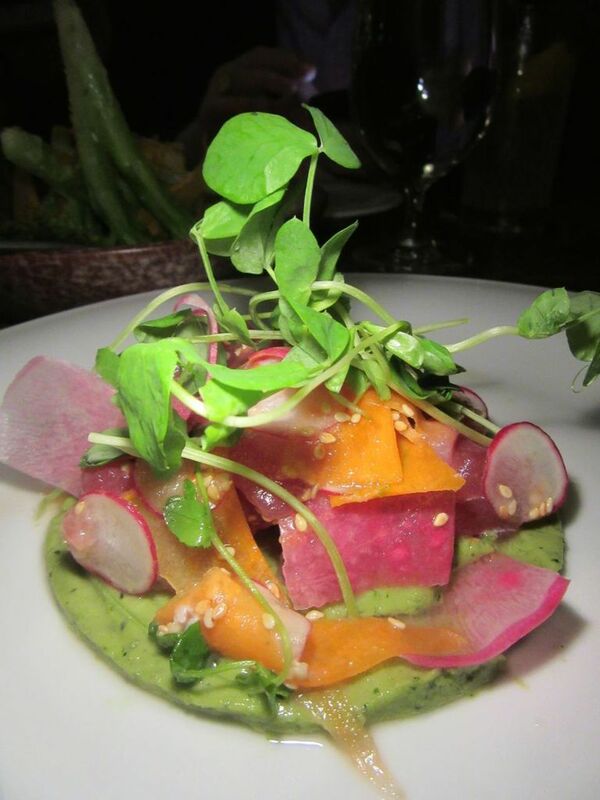 The ahi tuna poke with quinoa, avocado, sprouts and sesame miso is divided by our four. A very good burger comes with fries and a pickle. We ask the kitchen to quarter it for us. 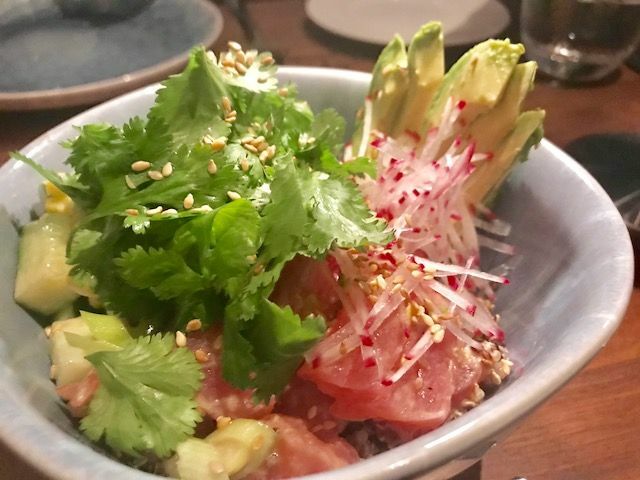 A big bowl of appealing and complex Ahi tuna poke with quinoa and avocado in a sesame miso is enough for four. We ask the kitchen to cut the cheeseburger in quarters. 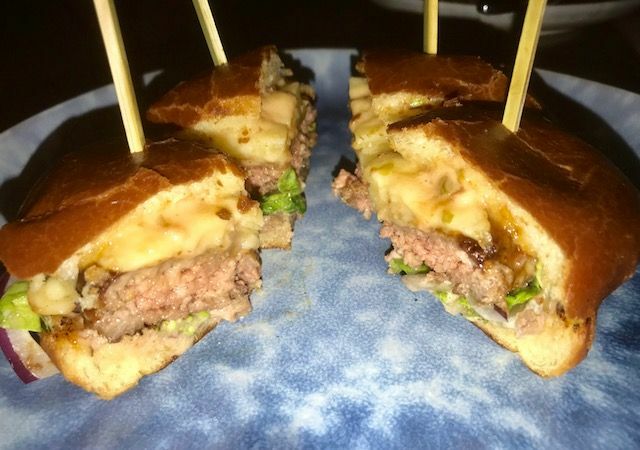 It layers Montgomery cheddar, gem lettuce and red onion with a mysterious house sauce. A cut of dill pickle and very good fries come alongside. There’s enough white meat and dark in the whole spiced farm chicken that no one can complain. I always like sticky toffee pudding. Its topped with pepper ice cream here. But none of my friends want to consider dessert. 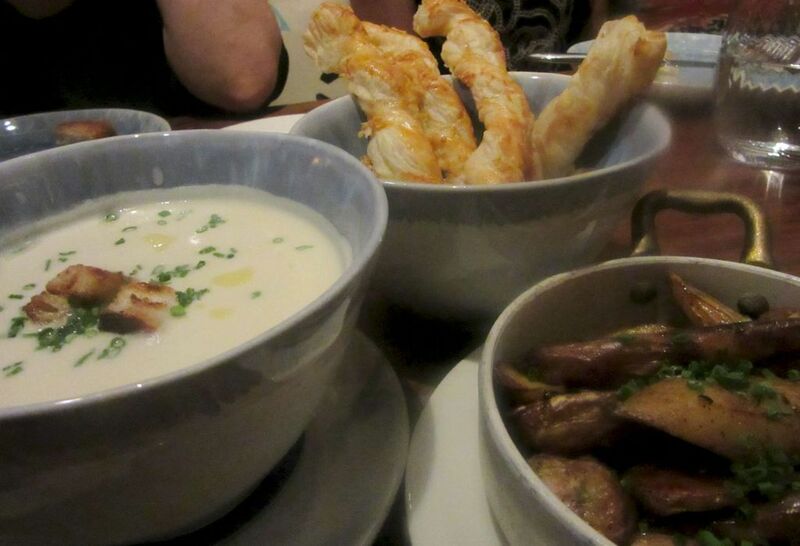 Too much bread in the space between courses most likely. 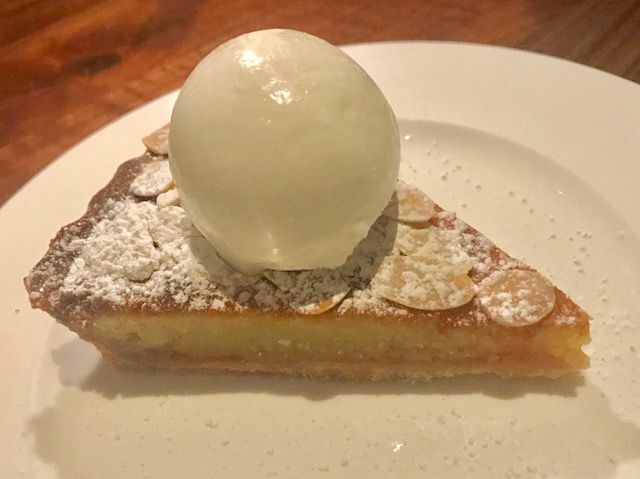 I finally order the tangy orange marmalade Bakewell tart with yogurt sorbet anyway. Do I make an appreciative hummmm? Everyone takes a taste. The orange marmalade Bakewell tart with yogurt sorbet is the only dessert I tasted. Too much bread, alas. I rarely eat lunch out and if I have free time in the afternoon, I’ll go to a movie rather than indulge in a proper tea. But if you fancy rituals, there’s this: For the month of October Bluebird tea -- 2 pm to 4:30 pm -- goes pink with the usual little sandwiches plus Victoria sponge cake, grapefruit tart and a gin-based cocktail. The pink G&T cocktail or Pink Bubbles. A dollar from every tea will go to the Breast Cancer Research Foundation. 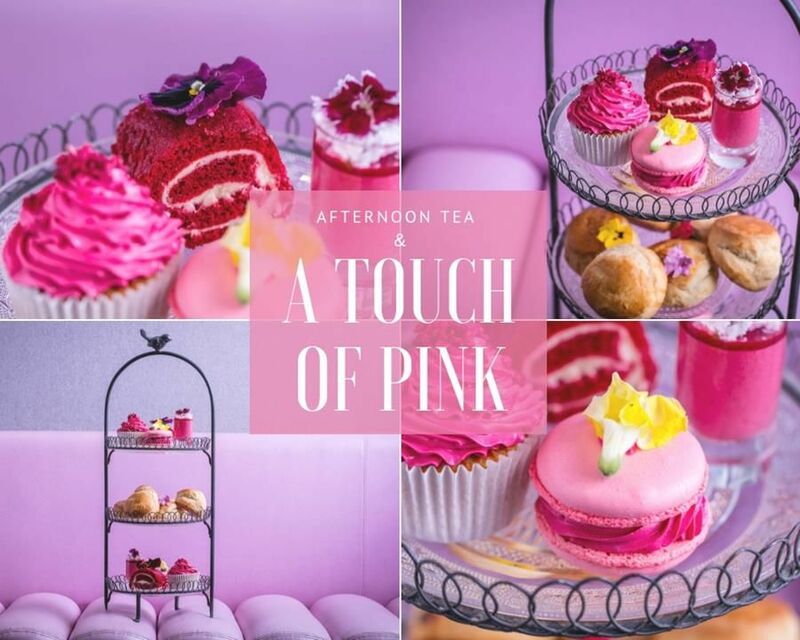 Bluebird London does a special pink afternoon tea in October to benefit the Breast Cancer Resarch Foundation. You might want to steal a menu on which the house offers “Essentials of Tea Etiquette” for local neophytes. Do put clotted cream under the jam. Do eat the finger sandwiches with your hands. Do sip the tea delicately. Don’t extend your pinky. Don’t dunk your biscuits. Don’t pronounce the long “0” in scones. It’s properly “scon.” Be ready to share your salmon finger sandwich with Meghan if she drops by. 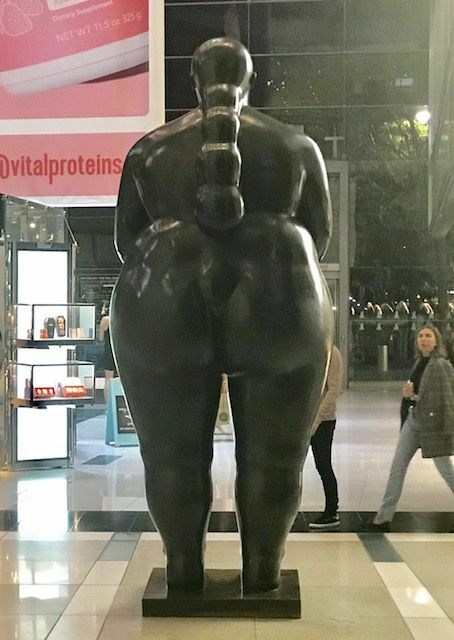 Here’s the view of Botero’s massive beauty from the down escalator. Definitely, need to skip the bread. 10 Columbus Circle between 58th and 60th streets. Third Floor. 347 682 2100. Monday to Friday lunch 11:45 am to 3:30 pm. Saturday and Sunday lunch 11 am to 3:30 pm. Monday to Sunday dinner 5:30 to 11 pm. Gallery Monday to Friday breakfast 8 am to 11:30 am. Monday to Friday lunch 11:45 am to 3:30 pm. Monday to Sunday dinner 3:30 to 11 pm. Monday to Sunday Afternoon Tea 2 pm to 4:30. 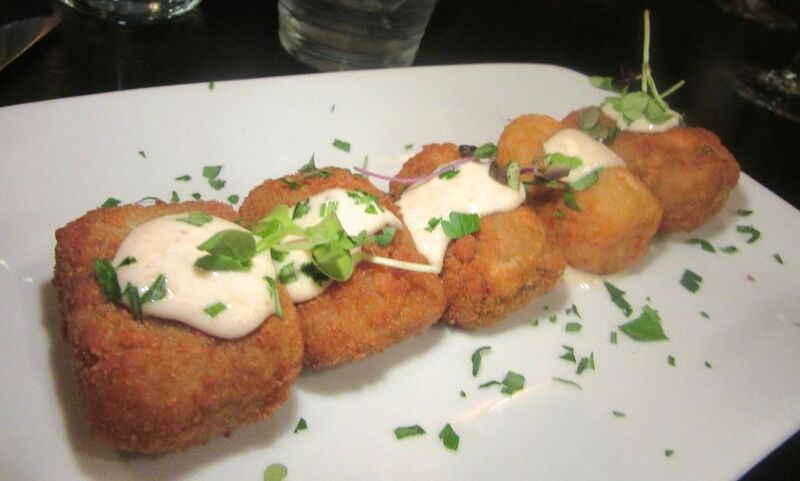 Bar/Lounge full menu by meal period and snack menu Monday to Friday 11:45 am to midnight. Saturday and Sunday 11 am to midnight.